Access to information and communication technologies is very essential for the growth of every individual and the community as a whole. A digitally inclusive society ensures equal participation by every citizen and is therefore very critical for the overall economic development of the nation. 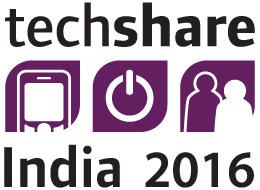 Techshare India 2016, sets out to address issues of access and use of ICT, mobile, TV, Video, Kiosks, wearable technologies and all the new technologies that each one of us is embracing on a day to day basis. Our belief is that awareness is the first step towards understanding how technology can make a significant difference in the lives of people with disabilities and the elderly. Provision of right infrastructure and design for inclusion to ensure easy connect to educational institutes, health clinics, government services to access knowledge, improve employment and drive economic growth. Develop the skills to use computers and the internet amongst every individual including people with disabilities and the elderly. Ensure real implementation of inclusive practices in the government as well as corporate actions, policies and programs.